§ 5 Responses to Ode to the Hunter Moon …"
Ha! We could’ve (almost) been in the same place last night! Although I’m not sure “Whoo!” ; ) my owl friend was, he sure has a BIG voice and sadly only spoke the once. Coyotes, on the other hand, were in full voice and I can only hope their population has hit the apex. We lost our sweet kitten Merddyn (Merlin) to the pack last year (as did a lot of other families): and I know of farmers who’ve lost calves right out of the barnyard. These animals have lost all fear of man: past time for the hunter to once again become the hunted. @ Deb – It sure sounds like you enjoyed the owl concert! I love hearing them talk amongst themselves in the forest. But I am so sad to hear of your lost kitten. I’ve lost pets to the wild before, and now I don’t allow them outside unsupervised. It’s difficult to restrict their freedom, but even a big boy like Oli could easily be taken down by a pack of determined coyote. I hope the coyote population in your area comes back under control. Here, there seem to be but a few in the forest; singing off in the distance when the moon is bright. 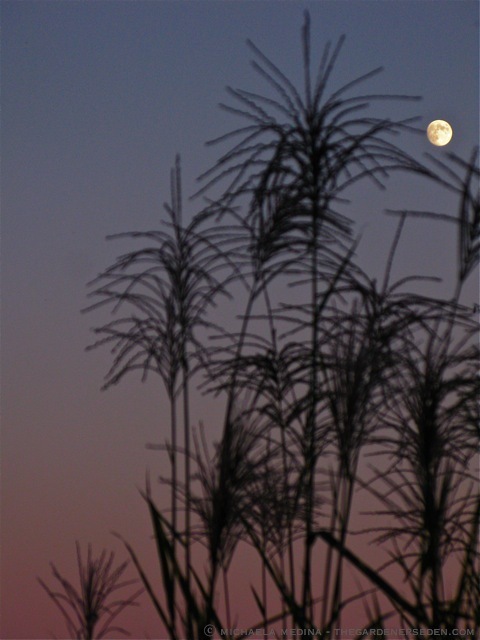 You are currently reading Ode to the Hunter Moon … at The Gardener's Eden.